Connect your SoundSeeders - soundseeder.com | Play music simultaneously on multiple devices. Click on “Available Players” if you have multiple players in your network and to select one of it manually. Soundseeder devices will discover each other automatically after they have been connected to the same Wi-Fi. If an device is not visible to your player, try to add it manually by entering its IP address. 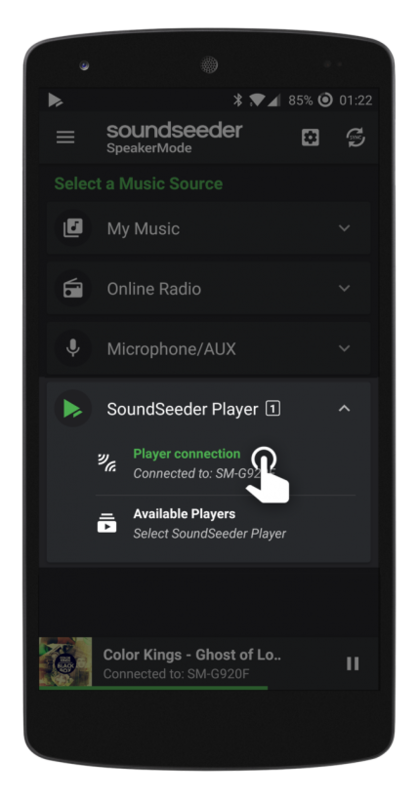 The IP address of your soundseeder device is displayed in the Settings (see Settings).